We currently have exhibitions in the UK, Germany and China (July 2016). We are delighted to announce our first exhibition in China, at the Guang Dong Science Centre in Guangzhou, China. 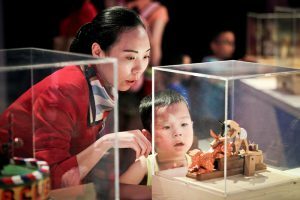 Forty of our CMT automata are included in the brand new Mechanical Moving Toys Exhibition, alongside works from Sharmanka Kinetic Theatre, and inspiring workshops and amazing new interactives from Fire the Inventor. Our Mechanicals exhibition is at Experimenta in Heilbronn, Germany. Finally, we have been collaborating with the House of Fairytales on their latest exhibition, The Clockwork Garden. It is capturing the imagination of children and adults alike at Quarry Bank Mill National Trust. See the current exhibitions page for more information on all these shows.